Eastern Oklahoma in the 1920s, in an area inhabited mostly by Cherokees. 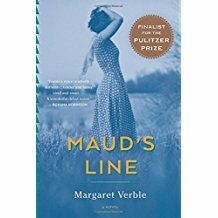 This is the setting for Margaret Verble’s remarkable, heart-breaking yet ultimately life-affirming first novel, Maud’s Line. Why did this book’s title grab me so sharply? First, because I was born in a town called Maud, Oklahoma. My interest was piqued further when I learned that Verble, like me, was also born in Oklahoma, and that she, like me–and, more importantly, like her major character–has Cherokee blood in her veins. Her book’s title, however, does not refer to a town, but to her compelling principal character, eighteen year old Maud Vail, and to the small allotment of land that ultimately falls to her. Though the territorial reach of the novel is measured in square miles, it still feels sprawling, though the sprawl is a much of family as it is of place. Counting all the relatives, it’s a big family. While Maud is a Cherokee, she has Choctaw as well as Creek family sprinkled throughout “the bottoms,” as it’s called. Clearly, it’s a land where family loyalty counts. Wherever you go in this bottom-land, you get there by walking, or on horseback, or on mule back, or by wagon. Only the rich have motorcars. Fortunately, most of Maud’s relatives live within walking distance of the house where she and her father, Mustard, and her brother, Lovely, live. (If you’re a really good walker, that is.) Mustard, the father, is hard-drinking, roughhousing, and a rogue. Lovely, though four years older than Maud, is a sensitive man-boy who seems barely half-there. Bad things happen to Lovely. There’s also Uncle Blue and Uncle Early. Aunt Viola. Aunt Lucy. Auntie Nan. But mostly, endearingly, enduringly, there’s Maud, a highly strung, intelligent, capable, gun-toting eighteen-year old with an on-the-brink sexuality who loves to read. She’s pretty, and sought-after by the local boys, but when an educated peddler (an ex-teacher) in a blue covered wagon enters the territory, with books among his items for sale, and a willingness to discuss and recommend them, Maud falls hard. Still, life on the Line is more than swooning over a white peddler. There’s lots going on. First there’s the cow whose spine is hideously slashed in two by evil-minded neighbors, the Mounts. There’s the dead, bloody dog the Mounts leave on the kitchen table when no one is at the house. There’s the discovery of a horrible scene of carnage at the Mounts’ cabin, and Maud’s anxiety over who in her family might be responsible. How does her fascination with this handsome stranger, not to mention the requirements of developing a serious relationship, compete with the onslaught of near-catastrophic events in her family? So she wrestles fretfully with how much she can tell him–the man she has come to love so compellingly. And all the while this feuding and mystery is treated by her relatives–however deeply they mark Maud–as more or less just the way things are “in the bottoms.” The bottom-land is full of characters and full of character, and the book is remarkable both for its description of the geographical and emotional landscape as it is for its rendering of these people’s terse, vernacular dialogue. Verble has a great ear. So: loyalty is important; family is everything. How does a romance compete with this? When, toward the end of the book, her father decides to “take to the hills” in hopes of hooking up with the outlaw Pretty Boy Floyd (after his suspected role in the murder of those evil and troublesome neighbors), Maud seems the only one among all the relatives who is deeply bothered. There’s an old-fashioned feel to Verble’s book–the emphasis on family, perhaps, and the insistence on a meticulous painting of the landscape–which caused one reviewer to evoke Willa Cather. I confess this wealth of description put me off at first, but I eventually came to appreciate it because it made me feel embedded. I was there. There on Maud’s walks into “the wild,” always carrying her rifle, in case of snakes. There when she lavished care on her brother, Lovely, brought low by a rabid dog bite or a descent into madness. There when, hungering after the truth, she parted the bushes to spy on the Mounts, those malicious neighbors, and encountered a scene of horror. There wherever she walked, and walked, and walked, through a sometimes parched and sometimes flooded land. Verble paints the land in such detail that the reader walks through it with her. But more there’s more. Despite the fact that I’m both male and many years older than Verble’s character, I identified strongly with this young woman, including the internal workings of her body as she becomes pregnant. I’ll never forget Maud Vail. Verble’s book was published last year, and nominated for the Pulitzer Prize. This entry was posted in Book Reviews, On Books, On Writing, Publications, Whatever. Bookmark the permalink.